On Tuesday, October 24, 2017 a resident of Feliciano, Argentina did her daily walk in San Jose Park and took a photograph at the moment a lightning occurred. 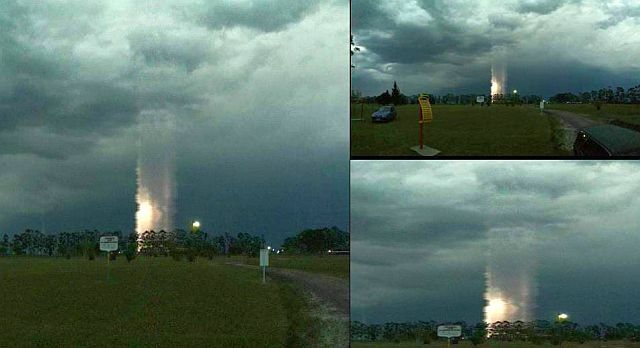 The amazing image made by the woman shows a mysterious light that seems to point to the sky. It appeared as if someone had put a huge tube somewhere up to heaven. 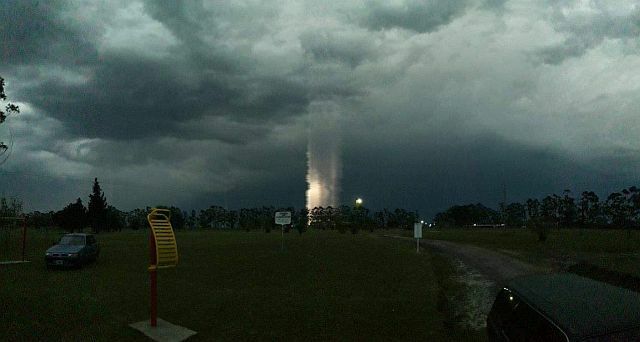 Although some people thought that it was a gateway to another world and others claimed that the phenomenon was related to time travel, the beam of light is more likely a rare natural phenomenon what occurred at the moment a cold front meets a warm front according to news site realidadregional. The two fronts cannot mix because of the difference in temperatures and densities. When both types cause a collision it can produce extreme weather events, including thunderstorms and even tornadoes.